To start, each partner needs to be facing each other. Before you start playing, each team ought to go in to a separate room to make a signal for when they have of a kind. Some examples could be winking, smiling, fluttering eyelashes, scratching your nose, licking your lips or anything else that would not immediately tip off the other teams. All signals must be above the table. Signal is a great team card game to play and is fun. It is not simple to get worn out of this game because it is so fun to play. You play with a regular deck of 52 cards. It can be played with four or more people. The object of the game is to get of a kind and then signal to your partner that you have it. If a player from another team notices another player give a signal, they can shout out "signal" and point to who they are calling it on. If that team does have of a kind then the team who called it out wins, in the event that they do not then the corresponding team wins. If the dealer runs out of cards before any team wins, then they can pick up the discarded pile and start over. Rotate dealers in a clockwise manner. The dealer then deals cards to each player and holds onto the remainder of the deck. 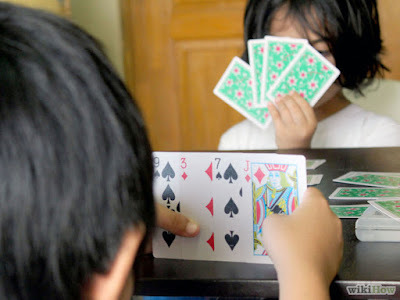 When everyone is prepared, the dealer will start picking up card at a time and passing it to the remainder of the players in a clockwise order. If a player desires the card that has been passed to them then they may replace it with another card in their hand. One time a player has of a kind, they will need to make use of their signal to show their partner they have of a kind. If a player sees their partner giving the signal then they need to shout out "signal!" If their partner does have of a kind then that team wins, in the event that they don't then that team loses. This game can go on for hours. Spice it up by rotating partners or thinking of new signal ideas. It is always fun to come up with a fool proof signal that you can use repeatedly with the same partner.